Jon Pertwee was talking about British television comedies when he likened the chaos in his hotel suite to a scene from a Marx Brothers film. Two women unloaded a crate of pop. Another shuttled in to change the sheets. Then a man hidden behind the bulk of a portable refrigerator trekked through the tiny living room. Pertwee, his extended legs resting on a coffee table, ran a hand through his mop of gray hair and laughed. The talk turned to "Doctor Who," arguably one of the most successful science-fiction programs ever produced. Pertwee played the good Doctor from 1970 to 1975. The British actor is in town for a "Doctor Who" convention Saturday and Sunday at the University of Texas at El Paso. "I find 'Doctor Who' fans to be very warm, bright and loving," Pertwee said in a lilting British accent. "A large number of them seem to be connected to the computer and electronics fields. Ours is an escapist program which allows people to get out of the kitchen sink and journey to other planets and other times." The British program — which airs locally at 9 p.m. Saturdays on Channel 13-KCOS (PBS) — enjoys airtime throughout the world. Today, KCOS will air a "Doctor Who" marathon from 5 p.m. to 2:30 a.m. The "Doctor Who Celebration and Tour '87-'88" will last 78 weeks and features costumes, props and guest stars from the series. The popularity of "Doctor Who" is rivaled perhaps only by that of "Star Trek," the stateside offering of space exploration. Pertwee shook his head. "You can't really compare our show with 'Star Trek,'" he said. "First of all, 'Star Trek' had a tremendous budget compared to ours. Second, the U.S. is a place where money is all that counts. 'Star Trek' didn't make any its first time around so it died. Our budget didn't allow for high tech sets, but it stayed on the air for years. Overall, Britain has many shows on the air which don't make money, but are top quality." And then came the clincher: "When I'm at science-fiction conventions, the reaction to my appearance is every bit as strong as the one to the 'Star Trek' actors." 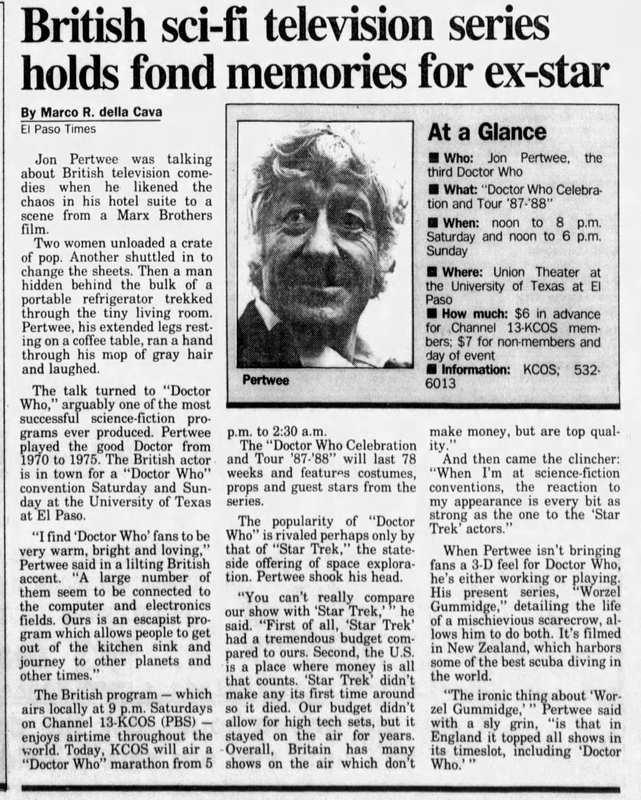 When Pertwee isn't bringing fans a 3-D feel for Doctor Who, he's either working or playing. His present series, "Worzel Gummidge," detailing the life of a mischievious scarecrow, allows him to do both. It's filmed in New Zealand, which harbors some of the best scuba diving in the world. "The ironic thing about 'Worzel Gummidge,'" Pertwee said with a sly grin, "is that in England it topped all shows in its timeslot, including 'Doctor Who.'" What "Doctor Who Celebration and Tour '87-'88"
APA 6th ed. : Cava, Marco R. della (1987-11-20). British sci-fi television series holds fond memories for ex-star. El Paso Times p. 1D. MLA 7th ed. : Cava, Marco R. della. "British sci-fi television series holds fond memories for ex-star." El Paso Times [add city] 1987-11-20, 1D. Print. Turabian: Cava, Marco R. della. "British sci-fi television series holds fond memories for ex-star." El Paso Times, 1987-11-20, section, 1D edition. This page was last modified on 16 April 2019, at 02:16.